The Rule of Three by Eric Walters has been on the pile, okay, okay, mountain to read for a while. I love me a good post apocalyptic book and this did not disappoint. One afternoon, the computers at Adam Daley’s high school shut down. At first, everyone thinks it is a power outage but everyone soon realizes that it’s the computers that run the power grid and that run pretty much everything else have stopped working. The reader experiences through Adam’s point of view the shock and fear of resources dwindling, crises mounting and chaos. Adam has an unusual advantage because his mother is the police captain and his next-door neighbor, Herb, is a retired government something or another, it’s classified and Herb doesn’t really share. But without Herb and his knowledge on how to handle these types of ‘situations’, Adam and the rest of the community might not survive. 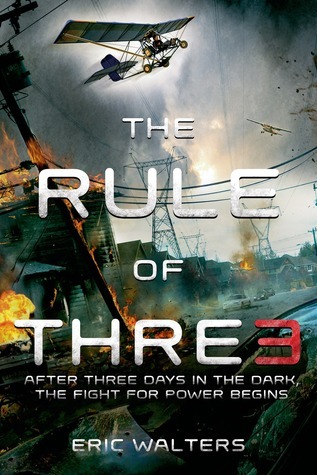 This entry was posted in Post Apocalyptic, Young Adult and tagged Eric Walters, Military, post apocalyptic, Rule of 3 Book 1, The Rule of Three, Young Adult, Young-adult fiction. Bookmark the permalink.